Last week, I wrote about our recent vacation to North Carolina’s Outer Banks. As promised, today I’m sharing with you some delightful discoveries on our road trip south from New York City, during our overnight stay in Rehoboth, Delaware. We chose Rehoboth simply because it was a good half-way stopping point on our route. What a pleasant surprise this little seaside town turned out to be be for us — the pups included! Not only would I recommend Rehoboth as a a terrific stop for those on the road, but I also would recommend this as a nice weekend getaway. It’s just over three hours from Manhattan, including a scenic ferry ride from New Jersey’s Cape May crossing over into Delaware; and for those of you in the DC/Virginia area, it’s also not too far of a drive. Take note, there’s a lively LGBT community here as well; so while there’s definitely a laid-back seaside vibe, there’s also a lively night life happening around here. The Homestead Inn is one of the most charming pet-friendly Bed & Breakfasts I’ve stayed in — my thanks to BringFido.com for the recommendation. Innkeepers David and Joe are the perfect hosts — Joe came out to greet us right away as we first let Otis and Galileo run around the enclosed grassy backyard area before checking in. The common area is a cozy space of a few tables and, in the midst of all materials for travelers about local businesses and events, there’s an array of stuff for the pups, from treats to beach towels. When we made the reservation, we let our hosts know we were vegans (a rule of thumb when doing the B & B thing), and they could not have been more accommodating: for breakfast the following morning, we were treated to tofu scrambles that were chock full of vegetables straight out of the backyard garden and roasted potatoes. They even gave us bread that was vegan so we could sample the homemade preserves. Delicious! Meanwhile, Otis and Galileo enjoyed some oatmeal before we all piled back into the car and continued on our way. Upon Joe’s recommendation, we went into the center of town for dinner at Hobo’s. 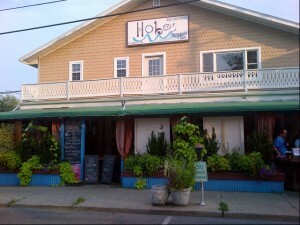 Though not specifically a vegan restaurant, Hobo’s has plenty of vegan options. While we enjoyed the patio dining (dogs are welcome — if only we’d known!) and “music poaching” (a woman’s singing Broadway tunes and standards at the place across the street), Seth had a Buddha Bowl. According to our server, the Buddha Bowl is perhaps Hobo’s best-known menu item: a healthy serving of rice topped with seasonal vegetables and your choice of sauce and protein. Seth chose a spicy sriracha sauce and seitan. I was very tempted to try a sesame-hoisin variation, but instead I held true to one of my personal rules: whenever there’s a spinach salad on a menu, that’s what I go for. Here, the spinach salad made the most of seasonal produce. Everything so fresh and crisp! I also got to choose a protein, so I opted for Beyond Meat “Chicken” — a first for me in my spinach salad experiences, and the best chicken substitute on the market today. I didn’t have room for dessert, but Seth ordered the Forbidden Rice Pudding. For those of you who aren’t acquainted with Forbidden Rice, it’s a black/deep purple rice. In Hobo’s dessert, there’s no milk substitute — the pudding gets its creamy consistency from the starch of the rice as it’s blended with tropical fruit. In one of my parallel universes, I own a small lavender farm (right along side the universe where I own a little bookstore/organic salads cafe). 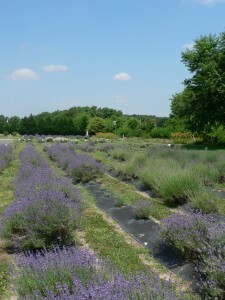 So when I heard about Lavender Fields — a five-acre farm in Milton, only about twenty minutes from Rehoboth — I got so excited we’d be able to make a quick stop. I just love the bright purple flowers against a summer blue sky! And a brief browse around the farm’s quaint shop resulted in a couple of inexpensive treats to myself. First, a trio of small sachets to replace the ones in my drawers back home that I bought several months ago at a local farmers market in the city. Second, a homemade product the farm calls Bugs Away. 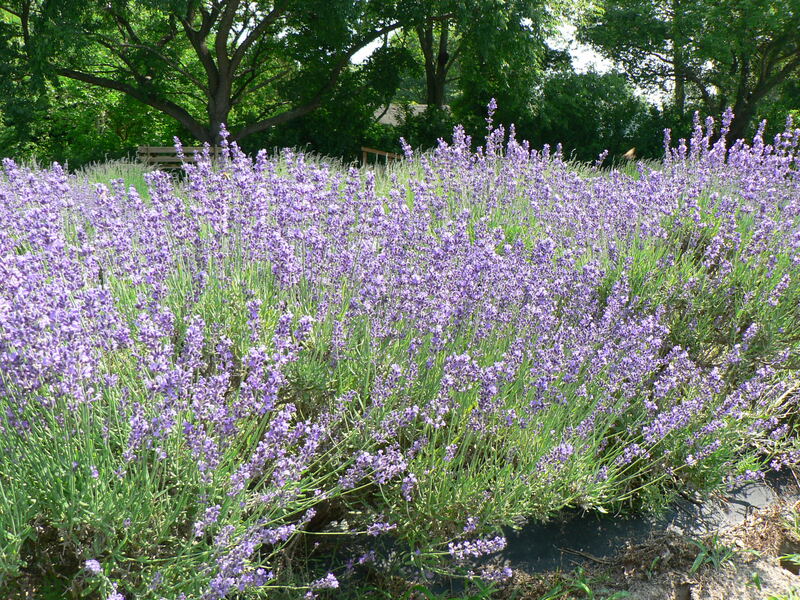 Did you know that mosquitoes don’t like the smell of lavender? What a fantastic cruelty-free, all-natural alternative to the chemical-laden bug repellants!